Inside the Bay Ridge Manor, smiling supporters may have been toasting former Mayor Rudolph Giuliani with a bit of the bubbly and nibbling on slices of birthday cake. But, it was a vastly different scene outside. Penned beyond metal barricades, across the street from the catering hall, which is located at 476 76th Street, protesters holding signs were making it crystal clear that they had little truck with “hizzoner,” who currently is running for the Republican presidential nomination and whose fundraiser was in full swing beyond the building’s brick façade. Their purpose in protesting was directly tied to Giuliani’s presidential aspirations. As he tries to make his way to the White House, he is attempting to capitalize on his image as the hero of 9/11. Rudy Giuliani has changed his story about 9/11. And if you bother to see the video on YouTube, Giuliani is not talking about World Trade Center No. 7. He firmly states he does not know its condition. Therefore, he was told before the collapse about the first two towers coming down. Why doesn’t America know that he was warned that the towers were going to collapse? Because the media are too busy with NASCAR and “American Idol” to care. BROOKLYN — Yesterday evening, former mayor Rudy Giuliani was scheduled to come to the Bay Ridge Manor to celebrate his birthday, part of a citywide sweep through the boroughs that began in City Island in the Bronx that morning. His supporters were scheduled to greet him. Giuliani’s support is considered very strong among Brooklyn’s Republicans, and those in New York in general. At least one club, the Bay Ridge Young Republican Club, has officially endorsed him for president. “He, more than any other candidate, understands the most critical issue facing us, and that is the need to stay on offense in the terrorists’ war against us,” said Bob Capano, Brooklyn Young Republican leader and staffer for Congressman Vito Fossella, D-Southwest Brooklyn/Staten Island. Putting Giuliani's lie in context: Who was the anonymous "engineer type person" who predicted collapse? Luke Rudowski, Sabrina Rivero and Tom Foti courageously confronted Rudy Giuliani about his foreknowledge of the collapse of the Twin Towers. Even Pat at Screw Loose Change quietly admitted, "Yes, as far as I know, Rudy's wrong when he says there was no forewarning of the possibility of collapse of the WTC towers." "At about 9:57 an EMS paramedic approached the FDNY Chief of Department and advised that an engineer in front of 7 WTC had just remarked that the Twin Towers in fact were in imminent danger of a total collapse" (302). Could it have been Harley Guy? We'll never know, because no one involved seems to know the name of this anonymous "engineer" with magical powers of foresight. Despite the title, this article is a little more balanced than the others. Critics questioning Mayor Giuliani's stewardship after the World Trade Center attacks marred the presidential candidate's campaign fund-raising swing through his hometown yesterday that was intended to highlight his national security credentials. The day got off to a rocky start for Mr. Giuliani, who a day after celebrating his 63rd birthday barnstormed through the city to collect campaign contributions for his White House bid. During his first stop of the day, in City Island, a woman confronted Mr. Giuliani, accusing him of knowing the twin towers would collapse but allowing rescue workers to remain inside, according to press accounts. Here’s an unwelcome birthday gift for Rudy Giuliani, as he travels around the city raising money: protests from fire fighters and family members of September 11th victims. They've shown up in the past at Giuliani's presidential events. Today, they’re gathering in Bay Ridge, and they have plans to follow him nationwide starting sometime around January, according to Jim Riches, a deputy chief with the fire department whose son was killed in the World Trade Center attacks. The group’s complaints center on the faulty radios used by the fire department that day and what they say was a lack of coordination at Ground Zero. And Riches disputes the notion that Giuliani provided any form of leadership on September 11 or in the days following. Candidate Paul Assigns Reading to Giuliani. Unfortunately, Congressman Paul is reinforcing blowback on 9/11, but this is still funny nonetheless. WASHINGTON (Reuters) - Longshot Republican presidential candidate Ron Paul (news, bio, voting record) on Thursday gave front-runner Rudy Giuliani a list of foreign-policy books to back up his contention that attacks by Islamic militants are fueled by the U.S. presence in the Middle East. "I'm giving Mr. Giuliani a reading assignment," the nine-term Texas congressman said as he stood behind a stack of books that included the report by the commission that examined the attacks on the United States on September 11, 2001. Giuliani was mayor of New York when Islamic militants slammed two commercial airliners into the World Trade Center, a role that has vaulted him to the front of the Republican presidential pack despite his liberal social positions. "I don't think he's qualified to be president," Paul said of Giuliani. "If he was to read the book and report back to me and say, 'I've changed my mind,' I would reconsider." You have taken to the streets, you have made the DVDs, you have been to the conferences, you have heard the testimony, you have made the calls, you have borne the brunt of criticism, (some of it deserved, some of it contrived to demoralize you), you have read the books, (the official and alternative theories), and you have decided where to cast your lot. And, you have decided to act! Now is the time to focus your energy like a laser beam. Now is the time to inject yourself into the political debate in this country, and by proxy, to inject discourse about 9/11 into the living rooms of America. Here is a clue. Last month activists confronted John Kerry with tough questions on WTC7 in Austin, TX. The video was posted to the internet. Alex Jones' infowars.com ran a story on Kerry's obfuscation, and this story was mirrored across the web. "Who do you think won the South Carolina GOP Presidential Debate?" We are told you will have to vote before midnight tonight for your vote to be counted. Many Wonder, Did Giuliani Profit From 9/11? (CBS) NEW YORK When Rudy Giuliani left office in 2001, he was worth a little less than $2 million. But official filings show he now could be worth 30 times that amount. And that has critics charging he's exploited a tragedy. Giuliani's become a multi-millionaire since Sept. 11. And that's not sitting well with FDNY Deputy Fire Chief Jim Riches. "He's making all this money on the backs of my dead son and all the other dead victims that day," Riches said. That's a serious charge, but it's echoing among Giuliani's critics in wake of his financial disclosures this week. It turns out the former mayor could be worth up to $66 million. Last year he collected speaking fees of $11.4 million, consulting fees of $4.1 million and fees from his Texas law firm of $1.2 million. Giuliani biographer Wayne Barrett said he's attended some of Giuliani's lucrative speeches. impacts what is happening today. 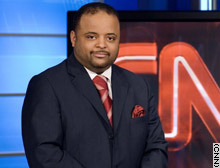 Roland S. Martin is a CNN contributor and a talk-show host for WVON-AM in Chicago. (CNN) -- Former New York Mayor Rudy Giuliani was declared the winner of Tuesday's Republican presidential debate in South Carolina, largely for his smack down of Texas Rep. Ron Paul, who suggested that America's foreign policy contributed to the destruction on September 11, 2001. Paul, who is more of a libertarian than a Republican, was trying to offer some perspective on the pitfalls of an interventionist policy by the American government in the affairs of the Middle East and other countries. "Have you ever read about the reasons they attacked us? They attack us because we've been over there. We've been bombing Iraq for 10 years," he said. Why Hasn’t Rudy Giuliani Read the 9-11 Commission Report? ARLINGTON, VA – During the "First in the South" GOP debate in South Carolina last night, one thing was made clear: Rudy Giuliani does not understand how to keep America safe. When Congressman Ron Paul, who has long served on the House Foreign Affairs Committee, explained how 50 years of American interventionism in the Middle East has helped compromise our national security, Giuliani interrupted saying he had "never heard anything so absurd." This statement is particularly troubling coming from the former mayor who tries to cast himself as a security expert, since Dr. Paul's point comes directly from the bi-partisan 9-11 Commission Report. "Rudy Giuliani has tip-toed around the issues of abortion, guns and marriage. The only issue he has left is security, and he doesn't even get that right," said campaign chairman Kent Snyder. "It is clear from his interruption that former Mayor Giuliani has not read the 9-11 Commission Report and has no clue on how to keep America safe." On Dec. 7, 2001, nearly three months after the terrorist attack that had made him a national hero and a little over three weeks before he would leave office, New York Mayor Rudolph W. Giuliani took the first official step toward making himself rich. The letter he dispatched to the city Conflicts of Interest Board that day asked permission to begin forming a consulting firm with three members of his outgoing administration. The company, Giuliani said, would provide "management consulting service to governments and business" and would seek out partners for a "wide-range of possible business, management and financial services" projects.